'A Bit Of A Montessori 2.0': Khan Academy Opens A Lab School : NPR Ed The education nonprofit that pioneered free, online tutoring and lectures is venturing into brick-and-mortar private schools. Is this the start of a two-tier Khan Academy? 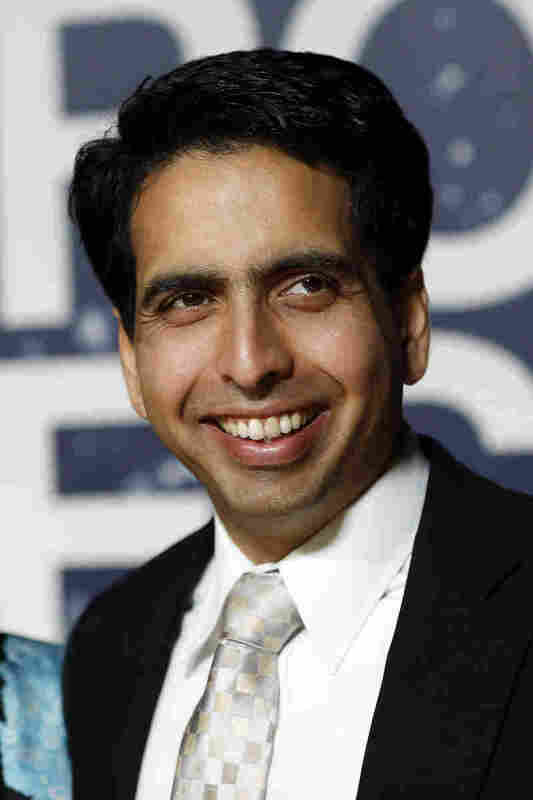 Salman "Sal" Khan, founder and executive director of Khan Academy, is venturing into brick-and-mortar private schools. As we've reported, students anywhere now can get free SAT test prep both online and in person at some Boys & Girls Clubs of America. The move may help level the playing field by improving test prep for less-affluent students to get them ready for the newly revamped SAT, which remains a pillar of college admissions despite the growth in 2015 in "test optional" schools. It's part of what Khan Academy calls its core duty to help provide "a free, world-class education for anyone, anywhere." But where does the new $23,000 a year ($25,000 for grades 6-12) brick-and-mortar Khan Lab School in Silicon Valley fit into that mission? I interviewed Khan Academy founder and CEO Salman Khan on Here & Now, the live midday news show from NPR and WBUR, about the value of coding, ed tech and why education videos aren't enough. What inspired you to start coding when you were a student? I was probably early high school or late middle school, and I had one of those TI-85 calculators. I just started reading the manual, and I realized I could make video games on it. And so that was my first hook. And that was back in the day when you didn't have the Internet to look up things and to get help. But that immediately got me hooked, where you said, hey, you can create anything you want using a computer. That's where I started. I eventually convinced a local professor to let me use some of his computers. But that was kind of my first glimpse about how exciting it could be. Why should kids, who may be struggling to learn the basics of addition and subtraction, learn the basics of coding? I think in the next few decades, at least having a strong familiarity with software and what programming can accomplish is pretty powerful. It seems like we have a long way to go, Sal, before coding becomes a foundational educational tool? The hard thing about programming is, it hasn't been there traditionally. So, you know, we're trying to find space for it in the traditional school system. A lot of educators haven't been exposed to it when they were young. So that's the challenge. But there's also an opportunity in that there isn't anything to replace. It's green field, it's a new area, and there's all sorts of incredible tools for people to learn. And when I talk about people, I'm not just talking about students — I'm talking about people of all ages. I encourage parents, teachers, people of all walks of life to start dabbling a little bit. What benefits do you see for adults who might be deep into their lives to hit restart and start learning the basics of coding? In almost any profession that you're in now, software is starting to play a larger and larger role. And the folks who at least have a familiarity with how a program works, how does software work, what is it capable of, what is it not capable of, they're going to be in a really great position to, especially if they wanted to start something, be entrepreneurial. You know, a lot of people have these phobias because they were in school, you know, they remember seeing the chalkboard and not knowing what was going on, mainly because they were pushed ahead while they had these gaps. But now you have all of these resources where you can go at your own time or pace, and what we hear over and over again is that they find it fun! You've launched the Khan Lab School — a brick-and-mortar school in Mountain View, Calif., in Silicon Valley. To some, that's like Amazon opening a bunch of brick-and-mortar stores. Why did you think it's necessary? A lot of people when they think about virtual anything, they do make that comparison of say an Amazon.com versus a Barnes & Noble. We at Khan Academy, we never viewed it that way. We view the virtual as something that can empower the physical — that if students can get lectures at their own time and pace, they can get exercises, they can have a programming platform, that doesn't mean that the classroom gets replaced; it means the classroom gets liberated. It doesn't have to be about a lecture anymore; students don't have to learn at the same time and pace. Classroom time could be much more about Socratic dialogue, building projects, whatever else. So we wanted to prove it out. We've been working with a lot of great schools who have been doing aspects of this, but we started a lab underneath our offices, literally, where we have mixed age, it's full-year, full-day. The students do mastery-based, personalized learning for kind of the first half of the day. We have a lot of focus on kind of meta-cognitive skills like entrepreneurship and creativity. The second half of the day — and they're here until 6 o'clock — they're building stuff, they're making things. All ages mixed together. That's a core ideal of Montessori. Is it a kind of Montessori-esque program? Yeah, you could almost imagine this is a bit of a Montessori 2.0. I mean, the whole principle of Montessori is students learn by exploration, play, they learn at their own time and pace, they have mixed age. And mixed age allows older students to mentor and younger students to get that mentorship, and what we're doing is exactly that. But Montessori has historically struggled as you go into the more advanced subjects, as you get to your algebra and your physics and your chemistry, and that's where tools like Khan Academy come into play. Because now students can still learn at their own time and pace, and they can still explore, and they can pull the information they need to solve real-world problems. So we are inspired by Montessori, and I would like to think that Maria Montessori would be pretty excited if she saw what was going on. Aren't you at risk of creating a two-tier system with your free lectures and your pricey private school? You know, Khan Academy is on track, and hopefully it does reach hundreds of millions, billions of students and empowers them where if they have a low-cost cellphone, they can start to self-educate themselves. But we think the opportunity now is not just online. We want to catalyze change more broadly. You know, what does a physical classroom look like? Break out of this kind of Prussian-factory model of education. And what we said was we needed to create a lab school, but we don't just want to create another one-off, progressive private school. So everything that we're doing in this lab school we're sharing — we're sharing with local public, private schools. All the curricula, we're going to open-source it and figure out what works, what doesn't. And when you figure out things that do work, share it with the rest of the planet. You'll openly share best practices learned out of this lab school? Yeah, that's the exact reason. The reason we did it as an independent school is so we could really push all of the boundaries. Fully mixed age would be very hard in any other context. Every six weeks, we kind of look at what worked, what didn't work, and we kind of reset it and reboot it and we try new things. So it really is in the spirit of innovation of Khan Academy. If we really want to understand what's possible in a physical classroom, we need a lab. You've spent a lot of time perfecting your online lectures. But there's been criticism, including of methods and the format itself — Khan Academy's "sage on the stage" lecture format. Some see that as outdated, whether done online or in person. Has your own understanding of what makes a good educator changed since you launched Khan Academy? Well, I think there's some reality to that notion that these lectures are lectures. And if you look at a Khan Academy video, they're these kind of traditional chalk-talk explanations. What's different is how someone consumes, or the attitude. You know, if you go to a traditional lecture hall, it's pushed onto you. While a Khan Academy-like video, you only watch it if you need to watch it. You're like, "Hey, wait. I don't quite get that. Let me go get a 10-minute explanation, and now I want to learn the next thing." So when you have lectures on demand, it really just kind of takes them off the table. They're there and they are useful sometimes, and then it allows you to work at your own time and pace, and you only watch the videos if you want an on-demand explanation. The man who's pioneered the online lecture is admitting there are deep limitations to them. I think they're valuable, but I'd never say they somehow constitute a complete education. If I'm confused about something, hey, to get a 5-, 10-minute explanation of it, I think that's valuable. The research shows that students learn best when they work through challenges together, stumble around, try to find answers and come up with solutions themselves with help from a good teacher. That's hard on a one-way lecture online. Everything we advocate — and this was some of the ideas of the Lab School — is that students should work on problems. [That] could be traditional problems or more open-ended inquiry-type projects, and while they're working through those they say, "Hey, wait, I need to figure out how fast this thing is gonna fall. I need help here." So, yes, I agree with that — the best way to do it is look at it from a problem-solving point of view, try to struggle with the problem, and then pull the knowledge as you need it. It could be an on-demand lecture, it could be looking at a reference book, asking your friend, asking a teacher, finding an article on the Internet. Whatever it is, it's going to stick much more than when it's pushed on to you.